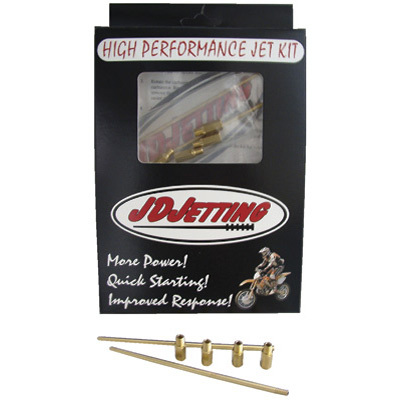 James Dean designed the JDJetting kits so that you don't have to be an expert to get professional high performance results!! The James Dean custom jetting kit is designed to improve throttle response throughout the range by using specially made multi-taper needles. These are based on the most popular settings used by new generation MX and off-road riders around the globe and the results are impressive. Exceeds the performance of the popular EMN, DTM, and other standard factory needle options. Low and High altitude custom designed triple taper needles. Main Jets included, Spare Needle Clip, and Dyno Tested. You can’t buy this from any OEM factory or aftermarket. It’s JD’s prescription for the headpipe blues.